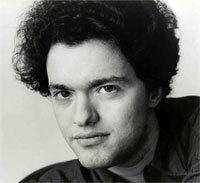 Evgeny Kissin was born in Moscow in October 1971 and began to play by ear and improvise on the piano at the age of two. At six he entered a special school for gifted children, the Moscow Gnessin School of Music, where he was a student of Anna Pavlovna Kantor, who has remained his only teacher. At the age of ten, he made his concerto debut playing Mozart's Piano Concerto K. 466, and gave his first solo recital in Moscow one year later. He came to international attention in March 1984 when, at the age of twelve, he performed Chopin's Piano Concertos 1 and 2 in the Great Hall of the Moscow Conservatory with the Moscow State Philharmonic, under Dmitri Kitaenko. This concert was recorded live by Melodia, and a two-LP album was released the following year. During the next two years, several Kissin performances in Moscow were recorded live and five more LPs were released by Melodia. Kissin's first appearances outside Russia were in 1985 in Eastern Europe, followed a year later by his first tour of Japan. In 1987 he made his West European debut at the Berlin Festival. In 1988 he toured Europe with the Moscow Virtuosi and Vladimir Spivakov and also made his London debut with the London Symphony Orchestra under Valery Gergiev. In December of the same year he performed with Herbert von Karajan and the Berlin Philharmonic in a New Year's concert which was broadcast internationally, with the performance repeated the following year at the Salzburg Easter Festival. Audio and video recordings of the New Year's concert were made by Deutsche Grammophon. In 1990, Kissin made his first appearance at the BBC Promenade Concerts in London and that same year made his North American debut, performing both Chopin piano concertos with the New York Philharmonic conducted by Zubin Mehta. The following week he opened Carnegie Hall's Centennial season with a spectacular debut recital, recorded live by BMG Classics. Musical awards and tributes from around the world have been showered upon Kissin. In 1987 he received the Crystal Prize of the Osaka Symphony Hall for the best performance of the year 1986 (which was his first performance in Japan). In 1991 he received the Musician of the Year Prize from the Chigiana Academy of Music in Siena, Italy. He was special guest at the 1992 Grammy Awards Ceremony, broadcast live to an audience estimated at over one billion, and became Musical America's youngest Instrumentalist of the Year in 1995. In 1997, he received the prestigious Triumph Award for his outstanding contribution to Russia's culture, one of the highest cultural honors to be awarded in the Russian Republic, and again, the youngest-ever awarded. He was the first pianist to be invited to give a recital at the BBC Proms (1997), and in the 2000 season, was the first concerto soloist ever to be invited to play in the Proms opening concert. In December 2003 in Moscow, he received the Shostakovich Award, one of Russia's highest musical honors. In June 2005, he was awarded an Honorary Membership in the Royal Academy of Music at London. Kissin's recordings have also received numerous awards and accolades, including the Edison Klassiek in The Netherlands and the Diapason d'Or and the Grande Prix of La Nouvelle Academie du Disque in France, as well as awards from music magazines throughout the world. In 2002 Kissin was named Echo Klassik Soloist of the Year. His first studio recording, in 1988 for RCA Red Seal, was of Rachmaninoff's Piano Concerto No. 2 with Gergiev/London Symphony Orchestra, and six Etudes-Tableaux, Op. 39. Kissin's discography encompasses a vast musical territory, and continues to win awards of the highest distinction. In September of 2007 he began recording the complete Beethoven piano concertos. Kissin's musicality, the depth and poetic quality of his interpretations, and his extraordinary virtuosity has placed him at the forefront of the world's new generation of young pianists. He is in demand the world over, and has appeared with many great conductors, including Abbado, Ashkenazy, Barenboim, Dohnanyi, Giulini, Levine, Maazel, Muti, Ozawa, Svetlanov and Temirkanov, as well as all the world's major orchestras. He makes regular recital tours to the United States, Canada, Japan and throughout Europe. His most recent honours include the Herbert von Karajan Award, Baden-Baden, Germany (2005), the Grammy Award for Best Instrumental Soloist Performance (without orchestra), 2006, and the Arturo Benedetti Michelangeli Award, Brescia, Italy (2007). Kissin and our Artistic Director have been friends since the 1990s, and he kindly agreed to become our Honorary Patron in 2006.